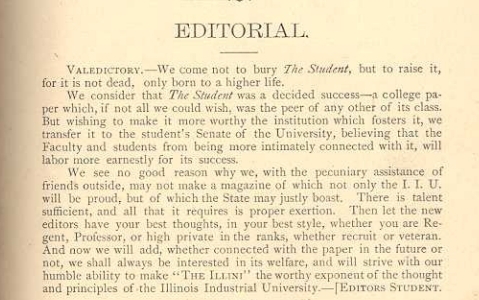 Reproduced with permission from the University of Illinois Archives Blog (http://archives.library.illinois.edu/blog/) The earliest recorded usage of the term “Illini” appears to have been in January 1874, when the weekly student newspaper changed its name from "The Student" to "The Illini." An editorial in the first issue of the renamed journal (1) implies that the term was coined and had not formally existed prior to 1874. 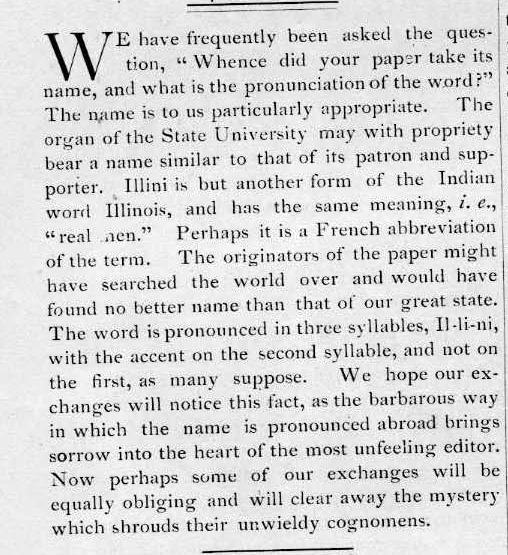 A similar statement about the name appeared in the December 9, 1882 issue of the Illini. During the late 19th century and the first years of the 20th century, "Illini" was often used to refer to the students, faculty, staff, and alumni of the University, as well as to the campus as a whole. Application of the term "Illini" specifically in reference to athletic teams seems to have been first by secondhand accounts of University athletic teams. The earliest reference in the Illio, the student yearbook, appears to be one mention in the summary of the 1907 football season. The term gained greater frequency in the next decade, especially during the 1914, 1915, and 1916 football seasons. Daily Illini articles and football programs prior to these dates do not extensively cite the term, at least to the extent of our staff’s knowledge. Other terms, such as the “Indians,” “our men,” “Orange and Blue,” and the “homecomers” were sometimes applied to the team, none in a consistent fashion, except for “Illinois” and “Varsity.” Appearing in a January 29, 1911 account of basketball game with Purdue, the earliest use of “fighting Illini” applied “fighting” more as a simple adjective describing the team’s efforts (albeit unsuccessful ones) just before the end of the first half. However, by March 3, 1911, the team appears have earned “fighting Illini” as a formal appellation evidenced in the newspaper report: ”Only a small crowd turned out to see our fighting Illini chase the Gophers back to their holes" (3). Well before the April 1917 entrance of the U.S. in World War I, the Daily Illini, included several further references to athletic teams as “fighting Illini” (1/18/1914, 9/23/1914, 10/24/1914, 1/27/1915, and 11/4/1916). Once University of Illinois students and alumni began participating in the war, the usage of “fighting Illini” became mixed, sometimes referring to the soldiers at war and sometimes referring to the University’s athletic teams, and this overlapping usage prevailed for the balance of the War. The evidence from the Daily Illini in the early to mid-teens indicates that the term first came into use in regard to athletic teams. However, once the connection was made to the soldiers during the war, “fighting Illini” became a powerful way to memorialize those Illini who had gone off to fight in Europe. Although the team and soldier references continued side-by-side, the War-related usage of “fighting Illini” was central to the fundraising campaign preceding the construction of Memorial Stadium. 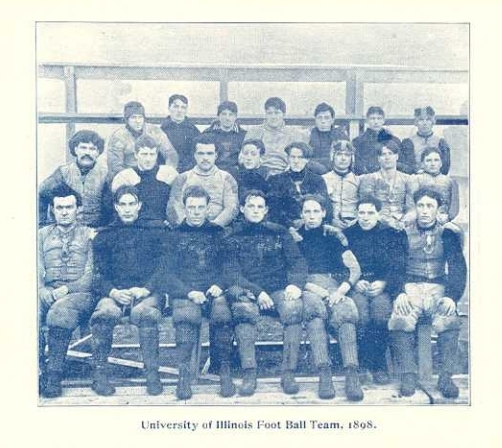 The University of Illinois Archives staff have not located any records indicating the date, if any, when the slogan "fighting Illini" was adopted as an official nickname (records from the Athletic Association are very sparse for this period). In the period between 1921-1930, it seems to have been adopted by general consensus as an unofficial nickname for the University’s athletic teams. It was used with increasing frequency in newspaper articles, football programs and other publications; additional research would be necessary to date this process more precisely. It is open to interpretation whether or not "fighting Illini" referred to Native Americans when the term was developed. 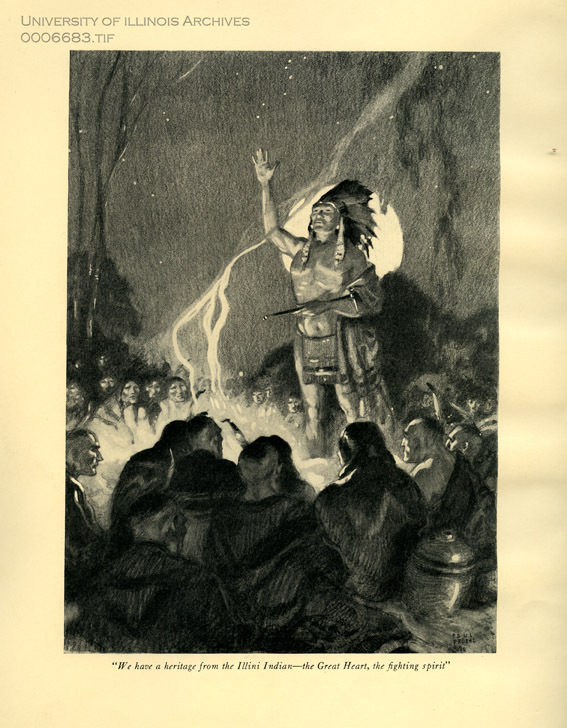 The time period during which the “fighting Illini” nickname developed coincided with the use of Native American imagery, usually in a romantic style. Therefore, it is not surprising that Native American imagery was sometimes associated with the Stadium Drive campaign and its slogan. Chris Prom, “Origin of the "Fighting Illini" name,” ExploreCU, accessed April 20, 2019, https://explorecu.org/items/show/258.